PUNE: Those loving their tipple have reason to celebrate as the deadline for permit rooms, bars and lounges in the city to stay open has been extended to 1.30am from the earlier 12.30am. 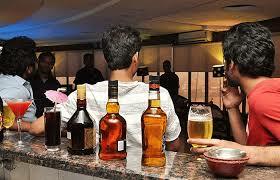 The extension in timing for liquor shops is up to 11.30pm from the earlier 10.30pm. An excise department official said that while the new 11.30pm deadline for wine shops may take time to be implemented as the requisite change will have to be made in the Bombay Foreign Liquor Rules, permit rooms and bars can instantly opt for the 1.30am deadline. The rules already stated that permit rooms and bars across Maharashtra could stay open till 1.30am and wine shops till 10.30pm, but permit rooms and bars in Pune would close at 12.30am because of orders from the police. Only Mumbai in the state had adopted the 1.30am deadline. The state government's revised timings, in a notification issued on December 19 under the Maharashtra Shops and Establishments (regulation of employment and conditions of service) Act, 2017, will become operational forthwith, said Mahesh Patil, president of the Pune Restaurant and Hoteliers Association. PRAHA had earlier written to the state government saying that though the government and the excise department had extended the closing timings for permit rooms to 1.30am, the Pune police were forcing them to shut at 12.30am. PRAHA vice-president Vikram Shetty said that permit rooms and restaurants that have the necessary staff strength can opt for the new deadline immediately. Industry sources said that the "last order" deadline in lounges and restaurants may now go up to 12.30am instead of the earlier 11.30 pm. Sunburn Pune will echo up to Delhi this NYE!